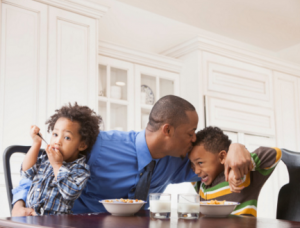 You are here: Home / News / Black Fathers Must be Respected. Black Fathers Must be Respected. (ThyBlackMan.com) The parental rights of a mother are pretty much set in stone unless something severe happens. She can make the sound argument that she carried the child for nine months and her position as mother should never be questioned. This has led many women to dictate the parental rights of fathers not seeing them as vital to the care and well being of the child as themselves. Far too often men are considered one of the children by women which is disrespectful and can alienate men in the parenting process. Fathers do not function, nor think, in the same manner as mothers and there is nothing wrong with having different approaches. Many sisters want black men to be fathers, but they must respect the fathers’ parental position. Black men, in large, love their children. They want to have the same opportunities to bond with the child as they are not the carrier. Far to often society dictates how we view black men as fathers no matter how incorrect the information may be. Black men that work hard to provide for their children while instilling discipline and love are often over looked to make the point that dads are dead beat. Too many women are sacrificing the well being of their children for their personal issues with the father. No one benefits in that situation and that father suffers right along with the child. There are men that hurt deeply in private because they long to spend time with their babies. This is something that has to stop for the sake of the well being of fathers and children mentally. This also gives mothers a chance to have the breaks they so badly need to re-group after child birth, and to center themselves mentally. Sisters can’t complain that they are stressed out doing everything when they are not willing to respect the parental balance fathers provide. If we are not going to have a serious community discussion about abusive, absentee, dead beat moms without questioning their parental standing we must re-evaluate how we view fathers. Many brothers change diapers, get up at night for feedings, cook, do laundry, give baths, help with homework, tend to sick kids, participate in extracurricular activities, and have an active role in the overall development of their children. These men are not just paychecks…they are parents. Furthermore, statically most married black men are married to black women. Many brothers are working along side their wives as a team. No marriage is without its challenges on both ends but there are many men committed to the wellbeing of their family. The media doesn’t want us to see how many sisters are not going through pregnancy, and parenthood alone because he is present to help her in everyway he can. There are black men that have walked with their children from the day he knew the child was coming into this world to the day he took his last breath. These men deserve to have their parenthood, and fatherhood respected. Our sons and daughters need their father just as much as they need their mother. So many black men are amazing fathers and partners. Brothers we see, acknowledge and appreciate you. I agree with the premise of your article. But keep in mind we are NOT black. We are African American genetically and brown in color. Black and White are racist inaccurate designations. What’s sad is that we African Americans are still calling ourselves BLACK because Caucasian oppressors called us that to contrast their color and to assign to us all the negative things BLACK is equated with in the dictionary. The fact is, like it or not and believe it or not, YOU ARE BROWN and your car tires are black. You can say black is a culture but when they deal with you, they deal with you based on it’s definition – dismal, gloomy, dark, diabolical, treacherous, devoid of light. WAKE UP AFRICAN AMERICANS. We do not call the Asian yellow man because he would not stand for it. We do not call the Native American a red man because he would not stand for it. We do not call the Hispanic man a brown man because he would not stand for it. And many Africans, Haitians and Jamaicans do not accept being called a color they know they are NOT. Ironically, African Americans are the only ethnic group/race on the planet which allows ourselves to be called a color we are not while ignoring our own eyes, allowing ourselves to be defined by that color, by someone else and then fighting to keep the lie in place – a “black” lie they purposely filled with negative definitions throughout America that inaccurately label and dehumanize an entire people. YOU CANNOT USE ANY OF THE LINKS IN THE CHAINS OF A LIE THAT BINDS YOU TO SET YOURSELF AND YOUR PEOPLE FREE. Is it any wonder that cops treat us as BLACK people by the definition of dismal, gloomy, treacherous, evil etc? We will never rise and overcome as a people if we allow other groups to define us, to define us with a lie and we are sadly willing to help them. AFRICAN AMERICAN LIVES MATTER PEOPLE. Black is the color of my car tires, not my skin. I am a family and relationship counselor who specializes in deprogramming African Americans from slavery mindsets.